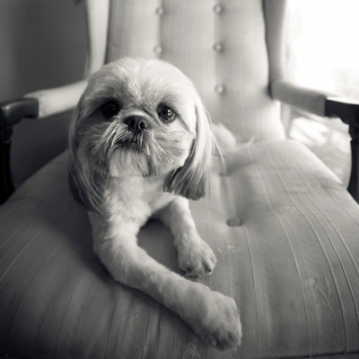 Early in 2002, my husband Bill and I surrendered Gizmo, our beloved, sickly 17-year-old Shih Tzu, to our kindly veterinarian, asking that he administer the shot to end our pet's suffering. We left in a fog of grief that intensified as time dragged by. While we often escaped our pet-empty house to go places, we became overwhelmed with loneliness once we returned to our silent home. Then, six weeks later, on a cold, rainy Friday afternoon, as I drove home from the city, I called Bill to say I was on my way. After warning me to drive carefully, he added, "You'll never guess what I found outside -- a young yellow cat -- huddled up by the garage out of the rain. He meowed pitifully when he saw me." "That's so sad - what did you do?" "Oh; I dried him off, wrapped him in a towel, and carried him around the block, thinking he must belong to our neighbor Jerry. But he didn't, and nobody knew where he came from." Remembering how Bill only had dogs as pets, I never thought he might adopt a cat. However, after welcoming this orphan into our laundry room and feeding him a can of tuna fish -- the only cat food we had, which he devoured -- Bill's heart softened. He found a cardboard box, lined it with old towels, and invited the lonely vagrant to spend the night in our garage, where he felt perfectly at home. Saturday and Sunday we provided our guest with food and drink, and he visited neighbors on either side of our house who also fed him. Bill and I conferred and decided that since we lost Gizmo, we needed a pet. Our neighbors already had cats, so it made sense for us to adopt this one. Sunday afternoon, Bill left without saying where he was going. He returned from PetSmart with cat food and a cat carrier on which he placed the sign, "Jerry Hartmeyer". I knew then that we had a cat. Bill explained, "If we're going to keep God's gift to us -- which this little cat is -- he should get checked out, so let's take him to the doctor first thing tomorrow." Our vet confirmed Jerry was about a year old and healthy, so we left him for shots and neutering. When we brought him home the next day, Jerry instantly disappeared under our second car in the garage where he slept on an old blanket for 24 hours. His pride had suffered at the vet's office, as well as his young body. But we knew he was healthy and ready to spend his life with us. Although Jerry cautiously entered our laundry room adjoining the garage for meals, he preferred sleeping in the garage at night. Gradually he grew accustomed to indoors, and eventually even slept with us on our bed. He captured our hearts with his antics and his silky golden hair. We loved to brush it each morning as we gave him catnip while playing with him and his cat toys. "Bill," I said, "isn't it funny how he's the same color that Gizmo was?" "Yes, and it seems more than coincidence that Jerry came so soon after we lost Gizmo: I wonder when he left if his gentle spirit found this poor, lost cat and directed him to us, knowing how Jerry could heal our broken hearts."